Kadampa, a peaceful hideaway in Causeway Bay, offers guided meditation sessions every Tuesday evening. They are free, but a donation is encouraged. If you want to go a little deeper, the centre also offers weekend courses, meditation retreats, empowerments and regular chanted prayers, and special events with senior guest teachers. While Kadampa teaches Buddhist teachings and philosophy, all—including non-buddhists—are welcome. This serene, light-filled space on Tai Ping Shan Street provides the perfect setting to learn how to meditate and shed layers of fear, anxiety and conditioning so that you can awaken your heart and discover your true, authentic self. The centre’s founder and spiritual director, Ocean WhiteHawk (known to her students as Mother Ocean), is dedicated to teaching the science of consciousness and soul training in the path of enlightenment. Find out more about Samadhi Training Centre For The Soul here. 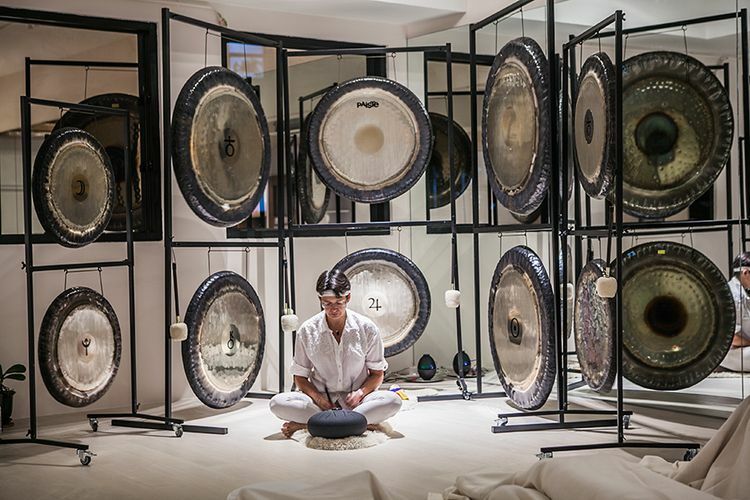 Red Doors Studio in Wong Chuk Hang puts focus on community and healing through meditation, Kundalini yoga and sound therapy—they house the largest gong collection in Asia—to bring ancient techniques into modern times to help you rebalance, relax and rejuvenate. Situated on Wellington Street in Central, The Sanctuary is a breath of fresh air in the heart of Hong Kong. As well as guided meditation, in both group classes and private sessions, the centre provides a range of alternative treatments and transformational techniques (including reiki and vibrational attunement to name a few) with the help of respected and knowledgeable practitioners. One of the city's most authentic yoga studios, it's no surprise that Anahata also offers guided meditation sessions in its sunlit studios. From kundalini meditation to work through your chakras to pranayama and meditation to bring your focus back to your breath, you're sure to leave Anahata feeling nothing but bliss.